The reason I particularly like this technique is because it works brilliantly from catching a leg that the opponent has tried to attack you with. Very often in a real encounter an opponent tries to kick or knee you and you catch his leg and then don't know what to do with it. 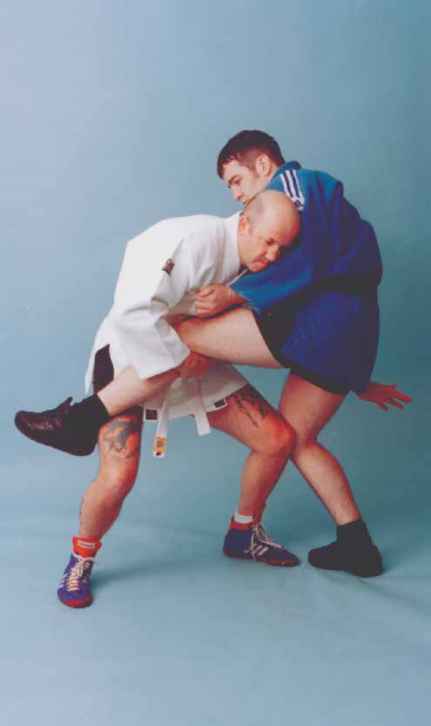 The trick is to take advantage of the caught leg and throw the opponent over by using it as an appendage. This works equally well if you catch a foot, a knee or if you simply bend down and pick the opponent's leg off the floor. For the sake of example we will work from simply picking the leg off the floor. Working from a right grip with a right lead stance, release your left hand from the grip on the opponent's sleeve, reach down and wrap your left arm around the back of his knee, picking his right leg off the floor. From here you are in a position to take an assortment of throws and take-downs. The one you choose is usually determined by what the opponent offers you. Release your right grip on the opponent's lapel, bend down, using your legs more than your back, and hook your right arm around the back of the opponent's left leg. Pick him off the floor and slam him down. How to do a dropkick in wrestling?